Join us for a great night of music and revelry to ring in the New Year with a massive dance party on the main floor of the Fox Theater. 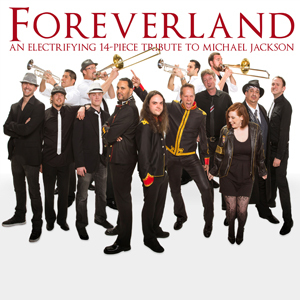 Our (21 and over) event features the Michael Jackson Tribute band Foreverland. Throughout this truly unforgettable performance, die-hard fans will relive their favorite MJ moments, and younger crowds will rediscover the amazing music that remains timeless. There are several options for you and your friends. First we offer a general GA ticket at $45, which provides you access to the theater at large, the sizable dance floor and over 600 fixed seats (first come first serve). Secondly, you may reserve a specific seat in the Mezzanine area for $60. There are only 149 of these seats and they are located in the front of the balcony. You cannot reserve tables on this site. You may add on a “Beverage Wristband” for $40. This wrist band will provide you unlimited beverages for one person up to midnight. You may only purchase them at the event.